South Africa 5-343 (AB de Villiers 128, Hashim Amla 122, Mohammad Irfan 2-34) beat Pakistan 309 (Shahid Afridi 88, Mohammad Hafeez 57, Ryan McLaren 3-56) by 34 runs. The Proteas hammered 343 runs for the loss of just four wickets in the allocated 50 overs and the innings of the Green Shirts was rolled back for 309 with 11 balls to spare. Hashim Amla and AB de Villiers (South Africa) were declared ‘Players of the match’ for their record breaking partnership and individual tons. The third and final One Day International of the five match series was played on Sunday, March 17, 2013, at New Wanderers Stadium, Johannesburg. Earlier, Misbah-ul-Haq, won the toss and surprisingly invited South Africa to bat first on a batting track. The decision proved vital as Graeme Smith was gone for just three runs and was replaced by Colin Ingram who joined in with Hashim Amla. The latter got off with 2 fours as Amla was unable to force the pace of scoring and scored just 17 runs from 43 balls when he lost his wicket at the total of 42 in 13.5 overs. AB de Villiers walked in next and hit 13 runs from the first 9 balls with a couple of fours. Amla was dropped at 36 by Mohammad Hafeez off Wahab Riaz on the second ball of the 19th over and the batsman completed his fifty, three overs later. AB de Villiers posted his fifty with a four in the 29th over with a four as a rain of boundaries started from the willows of the two batsmen. The score board started running and went past the 200 runs mark in the 37th over. Hashim Amla was the first to smash his hundred on the first delivery of the 39th over and that was his 11th in the limited overs cricket. AB de Villiers punished Mohammad Hafeez for 17 runs in the next five balls with 2 sixes and 1 four. He plundered his 14tth ODI century on the second ball of the 41st over with a four followed by 1 six from each of the two batsmen. The duo created a record third wicket partnership for the third wicket after adding 233 runs on the first delivery of the 44th over. The mammoth partnership was broken after 237 runs when Hashim Amla was caught by Misbah-ul-Haq off Wahab Riaz for 122 from 113 balls with 1 six and 9 fours. 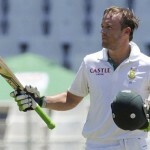 AB de Villiers was dismissed for 128 scored off 108 with 3 lofty sixes and 12 fours whereas Faf du Plessis scored a 45 quick fired runs from mere 19 balls with 3 sixes and 4 fours. 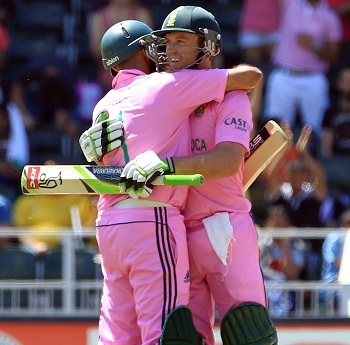 South Africa amassed 343 runs with five wickets in hand at the end of the 50 overs. 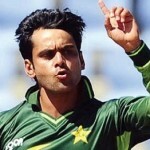 Mohammad Irfan and Wahab Riaz were the top wicket takers with two wickets each whereas Saeed Ajmal held one. Pakistan did not have a great beginning as Nasir Jamshed was removed for just 10 runs as Kamran Akmal associated with Kamran Akmal. The pair tried to pick up the run rate with regular boundaries as the score crossed 50 in the 10th over. Mohammad Hafeez was the most aggressive of the two, scored his runs through boundaries and completed his 16th Test fifty with 2 grand sixes. Kamran Akmal went back to the pavilion at 97 after scoring 30 runs and was replaced by Younis Khan. Mohammad Hafeez was unable to continue his innings and became the next victim for 57 off 49 deliveries with 3 sixes and 6 fours. Younis Khan and Shoaib Malik were dismissed cheaply for 19 and 4 runs respectively as Shahid Afridi and Misbah-ul-Haq got together in the park as the score reached 132 in 24.3 overs. The first hit 2 fours in the 26th over as Shahid Afridi took off with 2 big sixes in the next over. The batsmen preferred to attack and added 15 runs in the 29th over with 1 six and 1 four and the 31st over produced 17 runs with identical boundaries. Misbah-ul-Haq was caught behind by de Villiers off Ryan McLaren for 28 as the score touched 203 in 32.3 overs. Shahid Afridi took over and dispatched 3 mountainous sixes and 2 fours in the 33rd and 34th overs but was dropped at 80 by Smith off Lonwabo Tsotsobe on the first delivery of the 36th over. Afridi was finally caught by McLaren off Tsotsobe for a brilliant 88 from 48 mere balls with 7 gigantic sixes and 5 fours. The Green Shirts required 98 runs from the last 84 overs as the tail enders, Wahab Riaz and Saeed Ajmal, gave some hope to the visitors. The first was sending the ball over the rope frequently and enhanced the score to 282 in 43.1 overs when Saeed Ajmal surrendered for eight runs. Wahab Riaz was the last batsman who was clean bowled by Rory Klienveldt for 45 off 52 with 1 six and 5 fours as the entire Pakistani team was bowled out for 309 in 48.1 overs. Lonwabo Tsotsobe and Ryan McLaren were the highest wicket takers with three each, Robin Petersen got two whereas Dale Steyn and Rory Kleinveldt shared one wicket each. South Africa clinched the entertaining match against Pakistan by 34 runs and leads the five ODI series 2-1 and the fourth will be played on March 21, 2013, at Kingsmead, Durban.